But, with the great advances in technology that have gone on over the past few years, many facility managers today are using modern building automation systems (BAS) to identify control system problems, and in some cases, fix those issues in real time, saving money and possibly preventing system failure or malfunction. Among the many benefits of BAS is the ability to improve efficiency, operations, and maintain greater control within buildings. Here is a look at how BAS can help you identify and fix control system problems across a range of major building systems. Without a doubt the area that can present the most control system problems is HVAC. This is also a place where you can benefit the most by using a modern BAS to control, identify and solve issues and problems before they become a major headache, as in downtime, lost revenues, and possibly injury, for example. Wasted energy, whether it is due to equipment not working at peak performance or issues within the building or systems, is a major problem for every facility manager. A building automation system, though, allows you to not only automate systems, but also set up the BAS to detect any slight fluctuations in performance or output, and provide alerts when equipment falls below or goes above certain levels. It even enables you to fix control system problems in real time. For example, BAS can uncover issues within your heating and cooling system that would otherwise be undetectable until system failure. By being alerted to the problem—whether it is a slow leak or zone controller malfunctioning—you can address it immediately, saving money and most likely downtime. Depending on the size and type of facility, this topic can be critically important for larger buildings, warehouses, and bigger working spaces that are attached and/or run by the same HVAC system. Automating, controlling, and assessing air quality using BAS saves time and the system can be programmed to make adjustments in real time on its own if a problem is detected, such as switching ventilation/fans on when needed or adjusting the temperature. Lighting, appliance (water heating, refrigerators, freezers, etc.) and other electronic systems within a facility present some other key areas where a modern BAS can provide savings. These savings range from overall energy usage to lower maintenance and repair costs to longer life of equipment and devices through automation and analysis. A good example is alerting a facility manager when a battery is about to die, or switching to auxiliary power or a generator if the BAS detects a shutdown or loss of power. What is great about today’s building automation systems is being able to constantly assess building control systems based on preset performance or operating standards, and have those systems adjusted, such as through preset and variable scheduling, to save on wasted energy, and overall energy usage. BAS can also make fixes to malfunctioning systems, when needed, such as resetting a system or going to a backup or bypass. 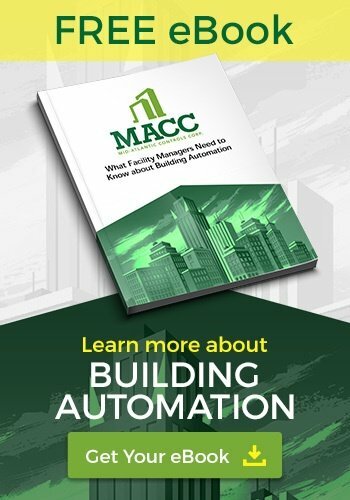 Facility managers who work with BAS and systems integration companies to build a platform that brings all systems together on the cutting edge are realizing the full capabilities and benefits of building automation systems. If you look at the security and fire alarm side of facility management, integrating these systems along with video surveillance can help you minimize false alarms, which can be both a pain and an expense. For example, Richmond, Virginia has fines for excessive false alarms, which are becoming a hot issue in the security industry with some cities, like Sandy Hook, creating false alarm ordinances, and many other cities have followed suit. Video verification allows for real-time verification of an alarm through your monitoring company, as well as the activation or deactivation of sprinkler systems. The BAS can also alert key people on staff, such facility manager, security lead, etc., as well as initiate evacuation protocols, open or lock doors, as needed, for example. That is the beauty of integrated and automated systems. The holy grail of building management is being able to integrate, assess, and leverage all building systems easily and in real time. In addition, it’s also to utilize all of the data that is being produced by these systems to improve overall operations, energy savings, systems performance, staffing, and access control. Using built-in analytics in your BAS and even pairing up with additional analytics software can help facility managers really take operations to the next level and achieve optimal energy savings while moving to a more predictive and preventive stance when it comes to facility and systems management.